Summary: The effects of artificial lighting are no longer limited to coastal properties. This proposal is the second phase of the Sea Turtle Education and Dark Sky Awareness campaign. Due to the popularity of educational material produced with Sea Turtle Grant #09-037E, ERM this project will reorder temporary tattoos and decals. Educational materials will emphasize the effects of artificial lighting on sea turtle populations. In addition, this project will develop and produce 50 sea turtle signs for beach access points. The signs will educate beachgoers on proper behavior regarding sea turtles and their conservation. 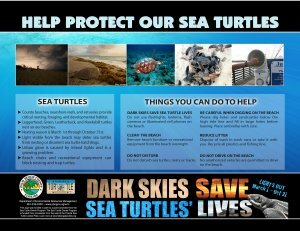 Signs will include basic sea turtle biology and information on local regulations and will also display the “Dark Skies Save Sea Turtles’ Lives” campaign. The signs will be distributed along the coastal regions of Palm Beach County. Education of key user groups and property owners can help to reduce the impacts of light pollution and furniture interactions by promoting a better understanding of the extent that Palm Beach County beaches are utilized by sea turtles and by providing the public with practices they can incorporate into their daily activities. Results: A majority of the temporary tattoos, decals and signs have been distributed throughout Palm Beach County at locations such as beachfront parks, condominiums, hotels, resorts and nature centers. The remainder of the material will be handed out during the 2012 nesting season and at the Dark Sky Festival planned for the spring of 2013. ERM staff has received positive feedback regarding the appeal of the educational material. People have really enjoyed the variety of the material and the colorful designs. The temporary tattoos have been a hit with old and young alike. All of the signs have been received with enthusiasm. Since we had a limited number of signs, other agencies and condominiums have requested information on the beach access signs so they can produce additional signs at their cost. Other agencies and groups have enjoyed the format of our educational material so much that many have requested templates so the design can be tailored to their agency.